ATLANTA August, 29 – As what could become Hurricane Gustav barrels towards the Gulf Coast, the Red Cross is moving both people and supplies into positions throughout the southeastern United States, including thousands of ready-to-eat meals and cots and dozens of Emergency Response Vehicles (ERVs). 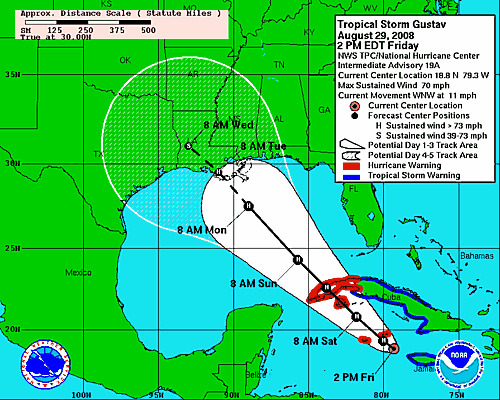 Prior to Gustav’s landfall, the Red Cross is preparing its own shelters and supporting other shelters that will be available for people needing to evacuate. Strategically placed warehouses and chapters allow the Red Cross to set up quickly in order to provide for the needs of those affected by storms and hurricanes. While Gustav is expected to make a Louisiana landfall, experts predict that it could impact other portions of the southeastern United States. For that reason, the Red Cross urges Georgians to prepare to take action if necessary. Although hurricanes are coastal storms, they can carry their force inland for hundreds of miles. Heavy rains, flooding, and tornadoes add to the damage that hurricanes can cause. Georgians should keep a watchful eye on Tropical Storm Gustav, and prepare now and during the rest of hurricane season to stay alert for the formation of these powerful storms. Call– your local emergency management or planning and zoning office to find out if you live in an area that could flood during heavy rains. Stay Informed- Listen to local radio and television reports for guidance when disaster threatens. Build a Disaster Kit- Include canned food and a can opener, a first aid kit battery powered radio and flashlight with extra batteries and special items for infant, elderly or disabled family members. Red Cross Safe and Well- If you live in an area which might be heavily impacted by the storm, the Red Cross urges you to register yourself and your family on the Safe And Well website, to let family and friends around the country know of their status. The website can be updated following evacuation or following the storm. Visit RedCross.org, and click on the Safe and Well link. Click on “List Myself as Safe and Well”, enter your pre-disaster address and phone number, and select any of the standard message options. If you are concerned about a loved one, click “Search” and enter the person’s name and pre- disaster phone number OR address. If they have registered, you will be able to view the messages that they posted. If yo don’t have internet access, you can call 1-800-RED-CROSS (1-800-733-2767) to register yourself and your family. Follow the prompts for disaster information. All American Red Cross disaster assistance is free, made possible by voluntary donations of time and money from the American people. You can help the victims of thousands of disasters across the country each year by making a financial gift to the American Red Cross Disaster Relief Fund, which enables the Red Cross to provide shelter, food, counseling and other assistance to victims of disaster. The American Red Cross honors donor intent. If you wish to designate your donation to a specific disaster please do so at the time of your donation. Call 1-800-RED CROSS or 1-800-257-7575 (Spanish). Contributions to the Disaster Relief Fund may be sent to your local American Red Cross chapter or to the American Red Cross, P.O. Box 37243, Washington, DC 20013. Internet users can make a secure online contribution by visiting www.redcross.org.